NEW YORK – January 14, 2016 — For the second year in a row, Taskstream – the leading assessment, accreditation, and e-portfolio software provider to higher education institutions – has been recognized for helping institutions advance student learning and institutional quality by the higher ed leaders who named it to University Business magazine’s “Readers’ Choice Top Products” for 2016. 2015 marked the conclusion of the pilot study of the MSC, a faculty-driven assessment initiative led by the American Association of Colleges and Universities (AAC&U) and State Higher Education Executive Officers (SHEEO) with funding from the Gates Foundation. Following the pilot study, Taskstream released feedback from a survey of pilot study participants that provided overwhelmingly positive feedback about the ease-of-use of the technology provided by Taskstream. AAC&U and SHEEO also recognized Taskstream for the company’s contributions to the initiative and future partnership as the MSC project expands to include more states and institutions across the country. In 2015, Taskstream also focused on making educational and inspirational resources more accessible to those seeking to improve student learning at their institutions. In June, they hosted CollabEx Live!, a user conference which brought members of the community from 36 states and 97 institutions together to share, create, and guide best practices within higher education. Taskstream also introduced a new online resource library that includes hundreds of webinars, presentations, and blog posts from thought leaders and members of the higher education community. 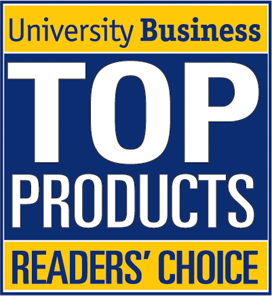 The Readers’ Choice Top Products has been announced online and in the January 2016 issue of University Business. Taskstream provides proven, reliable, and user-friendly technology and supporting services that help institutions focus more clearly on improving student learning outcomes and institutional quality. For more information, visit www.taskstream.com.